Gimoka discovery pack. This pack of 100 Nespresso ® compatible capsules consists of the whole Gimoka range except the deca capsules. You will find 2 boxes of references Decisio, Intenso, Vellutato, Lungo, Cremoso. 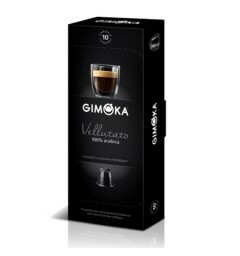 Italian coffee capsules compatible Vellutato of Gimoka coffee for Nespresso machines. fruit and chocolate notes give this greed Espresso 100% Arabica intense creamy and dense foam. 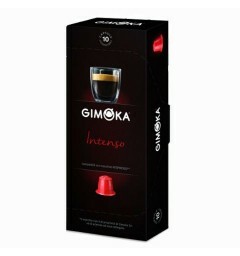 Italian coffee capsules Intenso Gimoka of coffee for Nespresso machines compatible. As the name indicates that coffee is a strong espresso finely acid generous foam. 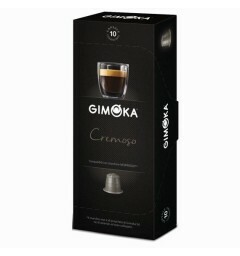 Italian coffee capsules compatible Cremoso of Gimoka coffee for Nespresso machines. Italian coffee blend perfectly balanced both fragrant flavors of nuts and dried fruit and subtle acid. 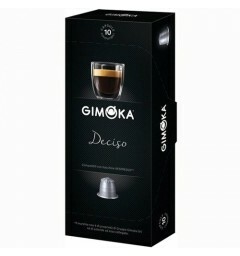 Italian coffee capsules compatible deciso of Gimoka coffee for Nespresso machines. Espresso long finish and intense flavors with woody flavored with dried fruit notes and cocoa. Italian coffee capsules Lungo Gimoka of coffee for Nespresso machines compatible. Pure Arabica from Central America to the balanced body and fruity flavor. Decaf Italian capsules Gimoka cafes compatible with Nespresso coffee makers . On the strength of this 3 you can enjoy Italian coffee capsule for Nespresso throughout the day.